In any case we met at the quarry pond in nearby Linkenheim for a run and a swim. It was hot 32°C (90°F) as we headed out for a roughly 5 km run. Despite the heat we ran an increasingly faster tempo, eventually circling back to the parking lot. The quarry pond has a nice sandy beach that is maintained by the town, on weekends they charge a fee for parking your car. Following the run we left our running shoes in the car and made our way over the beach to the pond. The water was a bit cool as we plunged in, but as our bodies cooled the water was actually quite warm. We swam around 500-600 meters, adequate for the event on Sunday. I felt quite comfortable in the water and swam easily. A couple weeks ago the water was so cold I could barely catch my breath while doing the freestyle. This morning I rode my bike the roughly 22 km (14 mi.) to work. On the way home I will try to ride part of this distance at my estimated race pace, which basically means as fast as possible because I have no idea what my race pace will be. The past week has been getting increasingly hot, I believe the highest temperature so far was 37°C (99°F). I have been taking advantage of my recovery week status and have been running less, 3 runs of 10-13 km (6-8 mi. ), and swimming more - 4 times over the week. I also rode my bike to work on Friday, which is 21.5 km (13.5 mi.) one way. With my sprint triathlon this coming Sunday I will continue running shorter runs so I can concentrate on swimming and cycling. The triathlon consists of 500 meters swimming, 20 km cycling and 5 km running - I believe the swimming distance is a bit less than some "sprint" distances. The water temperature in the pond was still around 16°C (61°F) just a week or two ago, but the hot days we have been having have done their work, the pond is warm enough to swim without a wetsuit (or so I'm told). 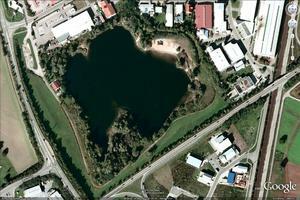 The first transition area is to the north of the first picture, roughly 100 meters from the pond, in a large parking lot. The 20 km cycling course begins on the street in front and turns onto a county highway, whereas we will complete 3 rounds, finally ending near the front of the sports hall on the other side of Blankenloch. The 5 km run portion is 2 rounds heading south out of Blankenloch towards the next town and back on the same path. For experienced Tri freaks this event is a joke, but for a totally new swimmer, cycling newbie, I'm terrified. My only goal for the Triathlon is to finish it. A year ago, when I was setting personal bests for almost every ultra distance that I ran, I probably could have done pretty well with the running and cycling. This year as a result of back problems and a leg injury I have only one speed, slow! I will of course try to be competitive, that's just how I am. At least my swimming has improved a little, the only question remaining is whether I will panic or not when attacked by the fast runners on their second loop. Some might think why I even want to do this when I seem to be so woefully unprepared. Based on all common reasoning I should probably stay home and train another year. Being an ultrarunner, my reasoning left the realm of "common" some years ago. I actually considered not starting several times over the last few weeks, but then I thought about the times that I dropped in a race and regretted it. Then I asked myself the question that I always ask myself now when I am having a hard time during a race "If you drop now will you be able to live with the decision in the morning?" The answer is simply "no"! There is no reason that I can't complete the triathlon, and if I am so slow that I finish in last place, so be it. I think the experience that I will gather during this first attempt will be invaluable. I have been playing with the ideal of a short Triathlon for a couple years, but didn't trust my swimming enough to do this. After my freestyle course over the winter a couple friends of mine from my running club, Bernd and Uli - both Ironman finishers, gently nudged me to the point where I heard myself say that I would do it. I have tried to keep up with my swimming since then, but other than that have been training for my ultra runs. With my sprint triathlon less than 3 weeks away my friends suggested a dress rehearsal. With about as much enthusiasm as a cow going off to the slaughter, I agreed and last night we met at a local quarry pond (Baggersee). Under the careful supervision of my two masters, I laid out two transition stations and we walked through what we wanted to accomplish over the next hour or so, namely a mini-triathlon. The water in the quarry ponds in our area usually start warming up in the hot days of May and June, but unfortunately we haven't had too many of them. The good news was that the last couple of days were around 80°F and the pond had warmed up considerable (according to my mentors). The bad news was that the "warmed-up" temperature was still around 17-18°C (63°F). I don't have a neoprene suit, and in most cases these aren't allowed during the summer events anyway. I was not looking forward to freezing my tiny hiny off! As we began our min-Tri I wore a normal bathing suit and elected to wear a tight-fitting running shirt hoping it would keep me warmer. I also had a bathing cap and my goggles. Friend Uli wore her Bikini in an attempt to convince me that the water was not THAT cold, and for safety Bernd wore a complete Neoprene suit in case he had to fish one of us out of the pond (I don't think he meant Uli). I walked to the water and tested it gingerly, and much to the surprise of my two mentors (and myself) I dove in and started across the pond. I quickly discovered that it is incredibly hard to breath correctly when you are shivering. There was a small island about 40-50 meters from the shore, I headed for this, trying to swim the freestyle, but mostly using the breast stroke because I couldn't get enough air. By the time I reached the island and turned I was very near panicking, but my mentors stayed near and encouraged me. After a while I settled down as I got used to the water and was able to freestyle swim, but much slower than I would in a swimming pool. After a few loops I decided we should continue with the next portion of our experiment and exited the pond and ran to the first "transition station". I wiped my feet quickly and put on my running socks and shoes, then realized I forgot my running shorts, but managed to pull them over the shoes. I decided to exchange my wet shirt for a dry own, then put on my sun glasses, helmet and headed to the parking lot with my bike. Bernd, who was going to accompany me was a bit slower as he had to wiggle out of his wetsuit. We headed out on a 10 km ride, a bit slower than race pace, but good enough to give me the feel for the bike portion of a tri. As we finished I hopped off my bike and deposited my sun glasses and helmut at the second "transition station" and grabbed my baseball cap. I started heading across the parking lot, Bernd first changed from his cycling shoes to running shoes. I haven't done any speed training this year (period), so he quickly caught me and we ran on. After about 10 minutes or so we turned around and headed back to the "finish". I learned a lot in this short session, having a couple experienced triathletes walk me through a tri is invaluable! I have a rough idea of how the transitions should run and can practice these a bit on my own. This was the first time that I swam, cycled and ran one after another. The practice session gave me a bit of insight on how this might feel during the sprint tri. On Saturday night is my 80 km (50 mi.) event, then I can spent the next two weeks cramming for my triathlon debut! Recovery weeks are always fun, first the weariness and stiffness from the race, then the listlessness from the lack of activity, and sometimes even a bit of post-race depression when the adrenalin wears off. I spent the last couple nights trying to catch up on odd jobs around the house, plus fighting a flood of strawberries in our garden, 42 kilograms so far this year and there is no end in sight. I also have lots of ideas floating through my head on other races that I would to participate in, but so little time, so many races. Speaking of races, this weekend I will be running the local 80 km (50 mi.) race, the Fidelitas Nachtlauf (Night Run). I've done absolutely zero specialized training for this race, thus will be using it for a long run for my main event in September, the KuSuH (who did their homework and knows what this is? Google knows). Last year I ran the Fidelitas Night Run in 9:02:05, a new personal best. This year I will run/walk at my kilometer killing 100 pace, so expect to take around 12 hours. My 100K running partner Birgit may decide at the last minute to run with me, but is still undecided. We went for a 10 mile run last night, she is leaning in the right direction with her decision. I have also been trying to swim and cycle a bit more in anticipation of my first sprint triathlon on July 11th, unfortunately the weather has not been cooperating and I have done much less than planned. Tonight I am meeting friends from my running club at a local quarry pond (Baggersee) for some training. The two Ironman finishers are going to do a run through including swimming, cycling and a short run, complete with transition stations. I am dreading the ice cold water, but need to get used to it. I don't have a Neoprene suit...luckily the sprint Tri has only 500 meters of swimming. Last night I came to grips with my secret fears inside and met friend Uli at the swimming pool in Karlsruhe. Fear? Yes, you see Uli and her husband Bernd are Ironman (Ironmen? ), and they have been the main catalyst in my decision to participate in a Triathlon. I have seen both of them swim, they make it look sooo easy, I mean I thrash through the water in comparison. I arrived at the pool a little early so I could warm up before Uli arrived. The pool was full, which didn't help my nerves, which were doing backflips due to my lack of confidence in my swimming ability. 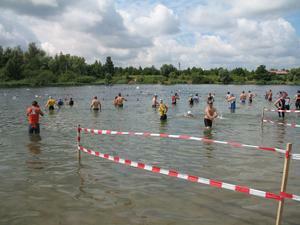 After a couple hundred meters I spotted Uli's red swimming cap and joined her. Bernd was with her, he wanted to train with the Triathlon club that met Friday nights. Uli warmed up with a lap as I talked to Bernd, then Bernd turned me over to my new swim instructor. Uli swam a lane with me, then got out of the pool and watched me as I swam the crawl back to the other side. To my surprise she said my technique was much better than she had expected. She mentioned that my main weak points seem to be that I don't lift my elbows out of the water enough and I need to learn to glide forward. From there Uli got down to business, we did lap after lap of various drills, with only a short pause after each to explain the next one. Most of the drills I recognized from my swim class, and I managed to once again prove how uncoordinated I am in the water. Luckily Uli understands the difficulties of a beginner and has a great sense of humor - she kept me smiling as she dogged me out. After about 45 minutes Uli noticed that I was suffering, and I admitted that I needed a break. She left me to unwind with some easy laps and she knocked out 700-800 meters of her own training. Afterward she suggested we do a couple fast laps, I knew there was no way this was going to happen. She took off in the lead and I tried to hang with her, after 25 meters I could barely lift my arms any longer, so slowed down. I met her at the end of the 50 meter lane and I said I probably need to swim the breast stroke back. As she took off I decided to at least try to crawl as far as I could, after about 25 meters I noticed Bernd was watching me from the sidelines, no stopping now, I tried to bring my form in grips and managed to make it to the end of the pool still crawling. At this point Bernd took over and suggested we go to the smaller pool in the back and work on some specific training. He showed me several different drills that I could use to improve various points in my swimming technique. Finally after almost two hours at the pool I headed for the showers, I was exhausted, this was the hardest swim workout ever! As I showered I thought about all that Bernd and Uli had said, it was clear that I have a lot of work ahead of me. But they both said that I should have no problem completing my sprint Triathlon in July, I only need to keep up the training. As I walked to the car my muscles ached, I was hungry, tired - but my heart glowed, I can't wait to head to the pool again! On Tuesday I met friend Birgit at the local research center for a couple laps around the outside of the lighted compound. Most of the snow from the previous weekend was gone, making it much safer to complete our 13.2 km (8.2 mi.) run. On Wednesday morning I stopped at the swimming pool in Karlsruhe on the way to work and did 1200 meters of laps, alternating 100 meter breaststroke and 100 meter crawl. My breathing is slowly improving, as is my overall swimming endurance. I still need to work a lot on my technique, but first when my breathing is more comfortable. Last night I met Birgit, Uli and Gerd at the local research center for two 6.6 km laps. It was a bit warmer than it has been, around 3°C/37°F, and the asphalt path surrounding the complex was mostly free of ice. We had a good time running and chatting, time goes fast in a group. Towards the end of the last round we were joined by Uli's husband Bernd, who ran from their house to join us. He talked Birgit and I into running part of a third loop with him, he knows Ultra runners are easy to talk into a couple more miles. Tonight I am meeting Uli at the pool, she is sitting out the Triathlon swim training that she usually does on Friday evenings and offered to give me some pointers on how to improve my swim technique. Uli completed her first Ironman in Zurich, Switzerland last year, she and her husband Bernd talked me into doing my first sprint Tri this coming summer - they obviously don't know how bad I swim. This weekend I have 24 km (15 mi.) on my training plan for Saturday and 20 hilly km (12.5 mi.) on Sunday, I hope the weather cooperates. We are supposed to get more snow in the next couple days, snow is okay, but ice I could do without...we'll see. My training is about a month behind last year's training, I figured out that I peaked about four weeks early last year, so adjusted my schedule accordingly. At the moment my body is still getting used to longer runs and higher mileage, most runs feel a bit sluggish in the moment - but last December was the same, so by next end of next month I should be ready for some hard training. Stay tuned. Snowy trails wearing me down, swimming SLOWLY improving. As the old year ticked over into the year I officially started training for the 2010 race season. Over the last three weeks I have been averaging around 80-85 km (50+ miles) of running a week, 10-15% more than I have on my training schedule. The past two weeks we have had up to 20 cm of snow on the ground, making longer runs challenging. On Saturday it warmed up just enough to make the snowy trails treacherous to run, I slipped and slid my way over 24 km (15 mi. ), the effort leaving my legs sore and tired, particularly noticeable when I woke up Sunday. I ended up reducing my Sunday run from 20 km to 13, no point in overdoing it on icy trails, besides my mileage was well over what I had on my training schedule. I was looking over my training plan yesterday afternoon and concluded that my training is much too advanced so early in the year. My gut feeling is that if I continue at this rate I may end up peaking way too early - not around the 100K in June when it is desirable. To counter this I want to drop back to 4 days a week running and add some weight training (Crossfit). I also want continue with my two days a week swimming for a couple more months, at least until my mileage starts to peak. Speaking of swimming, I was at the pool on Friday following work and for the first time in a couple months had a halfway decent workout. Since my swim course ended at the end of November I have been struggling to complete a 50 meter freestyle lap without running out of breath. On this particular night I slowed down and concentrated on my form and was completing 100 meter laps without hesitation. I swam a total of 1300 meters, alternating 100 meters of breaststroke and crawl, with a 5-10 breath pause at the end of each 100 meters, probably not impressive for most of you out there, but nevertheless a breakthrough for me. My swim goals for the next few months are to work up to 2000 meters combined breast/crawl by the end of June, with at least 700 meters nonstop crawl. The latter is needed for my sprint Tri in July, it will take lots of hard work! This page is an archive of recent entries in the Swimming category. Running Tips & Links is the previous category. The Diet is the next category.